One of the stars of Tuesday's inauguration was Aretha Franklin's wonderful hat. I'm a fan of hats, and this one is magnificen t.
A number of years ago (5? 6? 7?) 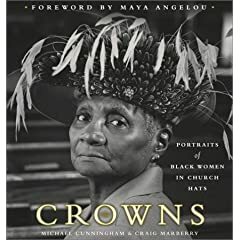 in my other life, the museum where I worked hosted an exhibition based on the book, "Crowns: Portraits of Black Women in Church Hats." That's what I immediately thought of when I saw this terrific hat. It's a known fact that church hats for African-American women are the best. And Aretha's hat is a prime example. I heard that it was a one-off. The owner of the Detroit hat shop said she would sell similar ones, but none just like that one. I agree, this was absolutely a great hat for television, and I didn't know about the chuch hat history. Thanks for the post, I loved the hat too. Do you suppose it's felted wool? Have You Sent Out Your 'Thank You' Notes?